So one sunny afternoon, we headed out to the backyard with a bucket of chalk and some pent up energy to expend. I wrote the numbers 1-12 in a grid using white, pink and blue chalk, with JJ calling out the numbers as we went. She can count aloud to 12 (and beyond) easily enough, so this part was easy. We also swapped roles, with JJ calling out numbers for me to jump on, and we played with multiple players when Mr Banya and Bee decided to join in. At one point we introduced an Illawara Flame Tree seed pod to our play (from our ongoing nature collection), rolling it across the numbers and calling out which one it landed on. We played with this simple number grid for ages, changing the rules as we went to keep it fun and spontaneous. 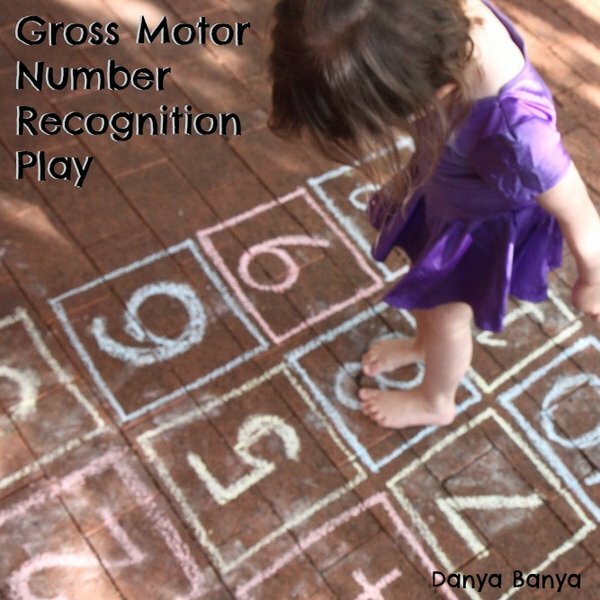 For older kids, you could introduce some easy sums into the play as well. While this activity was educational, the main point was to have some fun jumping around, so I didn’t want any lessons to feel forced. Number Jump! 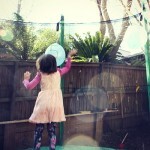 A similar style number recognition game, except with added balloons and a trampoline. We’ve done loads of number and counting themed nursery rhyme play – a few of our favourites are our 5 Little Duck finger puppets and our Hickory Dickory Dock rock clock. 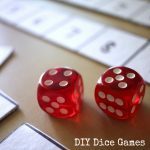 Here are some fun DIY dice games that works on a bunch of early maths skills through play. And if you’d like even MORE, don’t forget to subscribe! A great activity, Danya… lots of fun and educational at the same time. You think of the best games for your kids!!! We are in the dead of winter here but going to make up something like this indoors. My daughter is 3.5 so this numbers game would be perfect!! 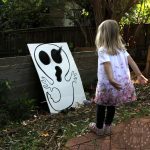 Yes I was thinking it could be done indoors, perhaps with fabric pens on a big sheet, or with markers on a big piece of cardboard, or with electrical tape on tiles or floorboards. Let me know how you go! http://dabblingmomma.blogspot.com/2014/01/learnin… This is what I decided to do! I used painters tape on our kitchen floor. I wanted the numbers to be randomly about and it worked out great. We started off throwing bean bags onto the numbers I called out and then Tiffany called numbers for me. After that she jumped on the numbers AND then we added dice to the game. We rolled the dice, Tiffany had to count the dots and then either throw the bean bag or jump to the number. We had a really good time AND it was still educational! Thanks for the great idea!! Such a fantastic idea Danya! My girls are also interested in numbers and counting at the moment so I think they will love this! Thanks for the idea! Awesome fun and great learning too 🙂 Pinned it. 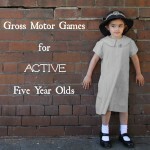 Great game, Danya, my Mr 4 would love this activity. He has temporarily "forgotten" how to count (something to do with a growth spurt, I suppose) so this is a fun way to gently reignite the learning. 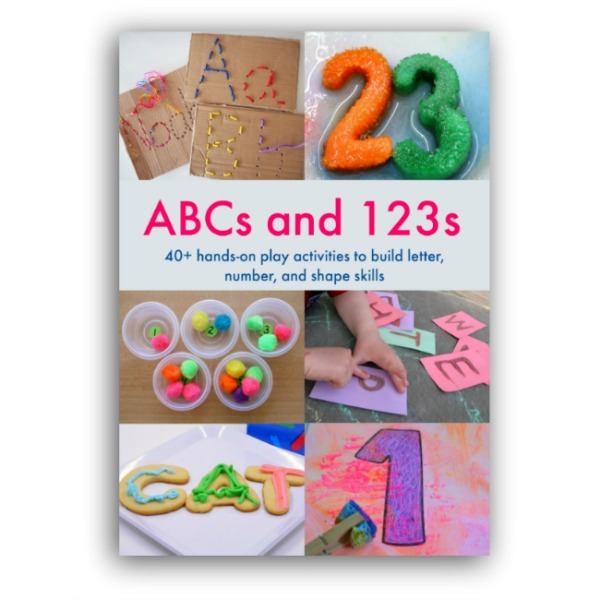 This looks like such fun and a great activity for learning numbers. 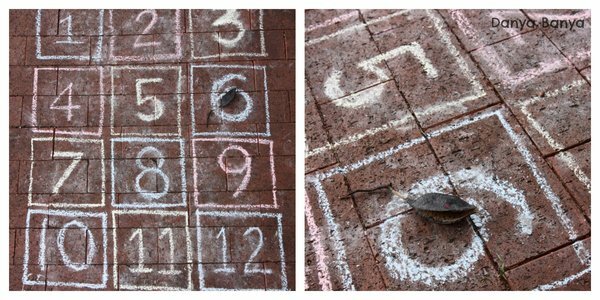 What a cool way to learn numbers… and how I wish we had just a little bit of concrete or paving somewhere to do this and other chalk activities! What a fun way to learn numbers, and with the great outdoors and a bucket of chalk. Thank you so much for sharing on my Facebook page, Danya! I love that this inexpensive to do and a wonderful way to learn visually! Pinned. 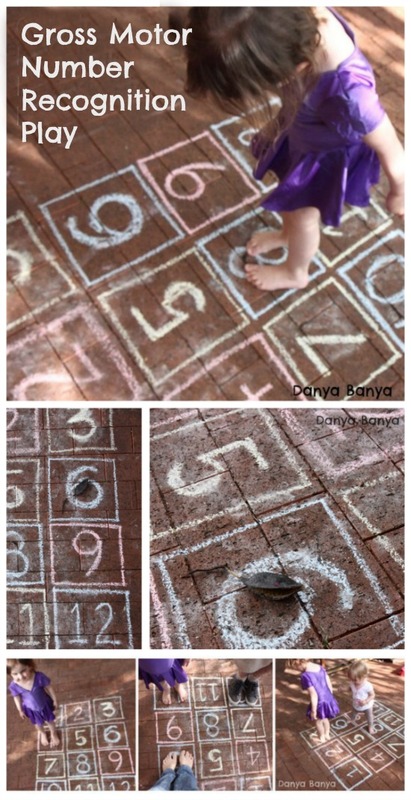 We love hopscotch..looks like this was a lot of fun. 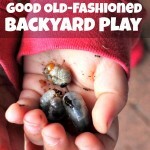 Thanks for linking to the Outdoor Play Party. Learning their numbers is a skill they will use all their life. Once they have that accomplished – they can go forward. 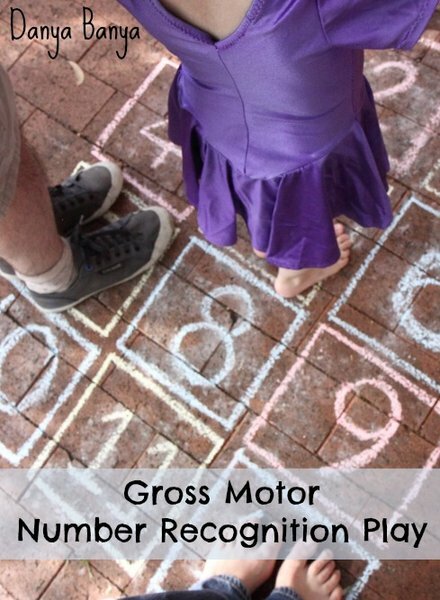 This game will develop your girls balance and fine motor skills too. Ticks all boxes.